I really like the designs of all the ships on this page. When I concepted the three rogue ships, I specifically wanted them to all look different, but other than that, the designs weren’t terribly important to me since I knew they’d only be appearing in a few panels. I ended up really liking the hammerhead-shaped ship, so when it came time to decide which ones were destroyed/damaged and which one wasn’t, it was a pretty easy decision. 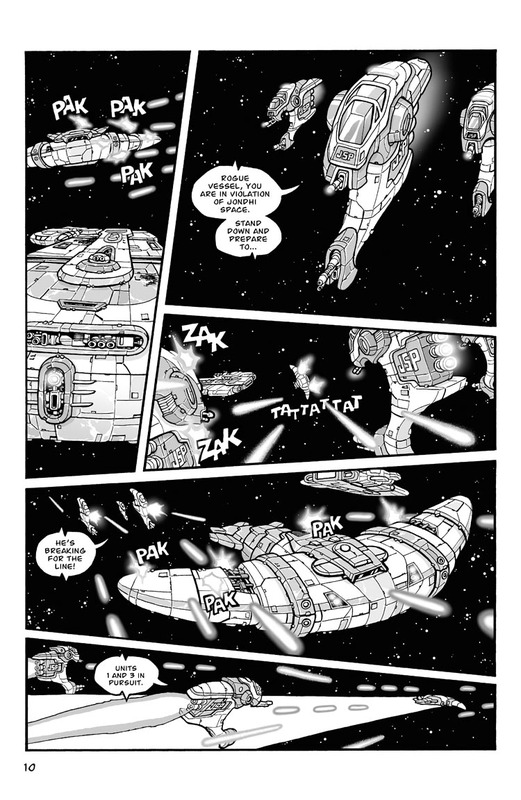 As for the Jondhi Space Patrol ships, I like the unconventional look to them in that they don’t look like the normal aerodynamic fighter ship. I just kinda liked the awkward curled-up-shrimp shape. I frequently see sci-fi fighter ships with opening pilot canopies, like real-world fighter jets. I thought it’d be cool to have a ship that instead had a small airlock through which the pilot would enter and then walk up to the actual cockpit from inside. nah. Keep ’em small. Pilot has to wriggle through..